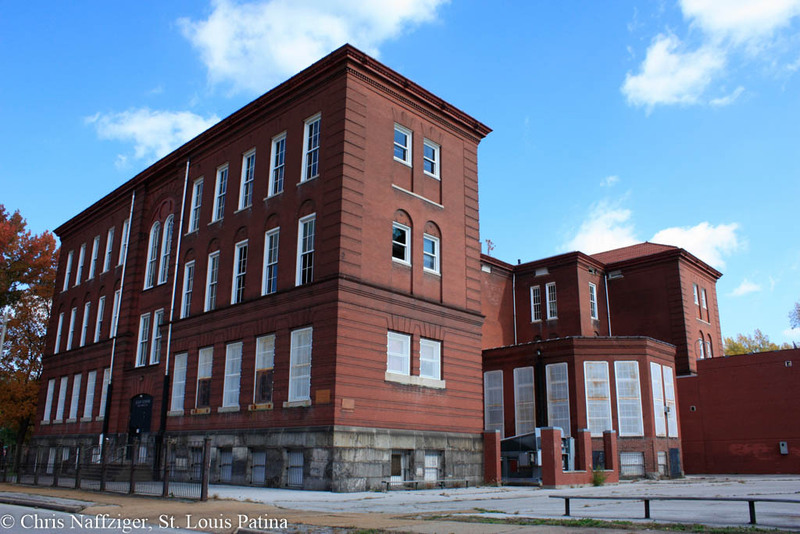 Update: In early August of 2018, the school sits empty above much as it did in September of 2017, windows open and the interior exposed to the elements. There is no sign of redevelopment in the future. 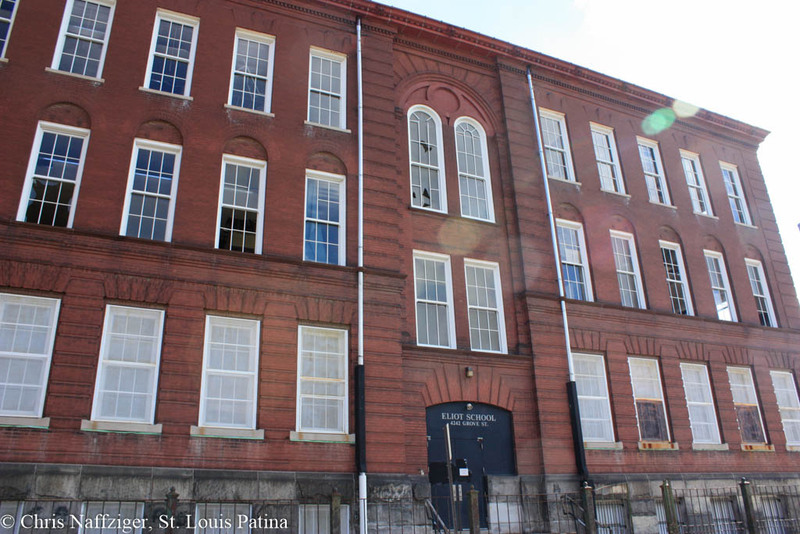 Sitting empty, the Eliot School never saw the rehabbing that its neighbor, Irving School received several years ago. As such, it sits empty. But it is a magnificent building, featuring strong, stout architecture with Italianate but also Romanesque influences. As such, it is that typical, non-selfconscious architecture that pervades Nineteenth Century America. 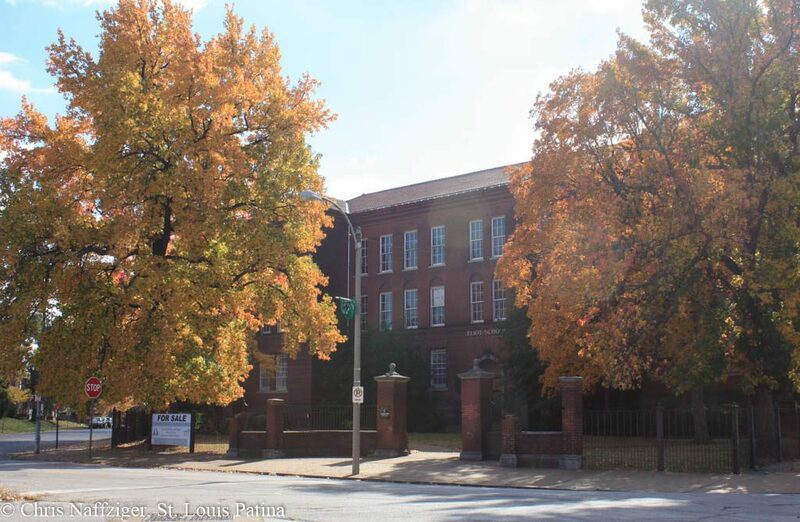 I read recently while doing an internet search that Eliot School was built in 1898, designed by William B. Ittner, an architect and commission of school buildings, and that it was the first school in the city to have indoor plumbing. I don’t recall any of our teachers telling us about its history, but I knew the school had already been in existence long before my classmates and I arrived at its doors. My uncles and father, who lived with my grandparents in a two-family flat on Farragut near Blair Ave, all attended Eliot, from around 1902 to 1915, after which they all went on to Yeatman High School (later Central High School). I attended Eliot from 3rd grade on, graduating with the 8th grade class of 1953, and then, like most of my class, went on to Central High. All the kids in the surrounding neighborhood went to Eliot or to Holy Trinity or Holy Name School in the ’40’s and 50’s. We all walked to school, sometimes walked home at lunch time, walked back, then walked home after school. Living on Penrose near Blair, I didn’t have to walk far–just a few blocks. Every June, Eliot School students celebrated the end of the school year with a parade through the neighborhood, followed by a picnic and day of fun at the big amusement park, Forest Park Highlands. guarantee that it would be rehabbed or even maintained. One of your photo shows a For Sale sign in front of the building. I hope you’ll let us know what happens next. Interesting, that is a very early example of his architecture then. He changes soon after that to a more English-influenced style. So many memories of the neighborhood and Eliot School. My mother and 3 of my uncles went to Eliot. Miss Hagan was a young teacher when they were there. She was my eighth grade teacher and when I was a senior in high school I did my Cadet teaching there. I lived at 1507 Penrose, next door to the church on the corner of Penrose and Blair, from 1965 until 1969. I have such good memories of walking to Eliot and how beautiful the neighborhood was. Many mothers maintained pretty rose gardens, and I thought I was dreaming about walking home for lunch from time to time…I assume we had to be back by a certain time. I remember the parades at the end of school. I also remember the custodians wore gray coveralls with their names embroidered on the front. They took very good care of our school, keeping the floors glistening, grass cut, etc. I remember, it seems like there was a sundial in the front, with beautiful red cannas planted around it. There was a busy y-street in front and our crossing guard, Grace, wore a blue uniform with white gloves and crossed us in the morning. Oh how the times changed. First grade through eighth, great memories. I too walked home everyday for lunch, in fact that is how I just came upon this site, telling my seven year old grandson my experiences. We lived on 20th behind Windsor Park, so enjoyed those days. I attended Eliot for the 6th, 7th, and 8th grade. I did not walk home from school, but instead ate at a little store owned by a man named Roy Rogers (really). Sometimes I ate at the baker on the corner (Schuler’s). I love that building — wish someone would restore it to its earlier beauty. I lived across the street from Eliot. 4234 N Florissant. I worked at Toys before, after and at lunch time. He was a great guy. The bakery was also great. Remember they had hot dogs at lunch!! I remember walking home twice every day that we didnt paper bag our lunch. The island out front of school was a big deal then, as you could get run over twice crossing the street.. Just ask Grace, lol. we had neighborhoods back then and had great friends, some for life. I would surely go back for just a little bit…. my last year was 69 and i went on to high school in another part of the state but remember well. I remember that island lol. And thanks for mentioning the name of the bakery..i had forgotten. I lived at 1413 penrose and went to eliot 3rd -7th..then was rezoned to Clay in fall of 64. Tim, I would love to see those photos! Can you e-mail them to me? I lived across the street from Eliot. 4234 N Florissant. I worked at Roys before, after and at lunch time. He was a great guy. The bakery was also great. Remember they had hot dogs at lunch!! I attended Elliot 3rd, 6th and 7th grades in the early 80’s. I thought this building was beautiful like a majestic piece of architecture at an early age. I loved the wide long hall ways and tall ceilings as a kid. Our neighborhoods were still mixed, we lived 20 hundred Penrose St. a block up from 5th District Police Station and Windsor Park. We had a great block unit, block parties and fun. I remember walking to school and having award ceremonies on the front lawn. 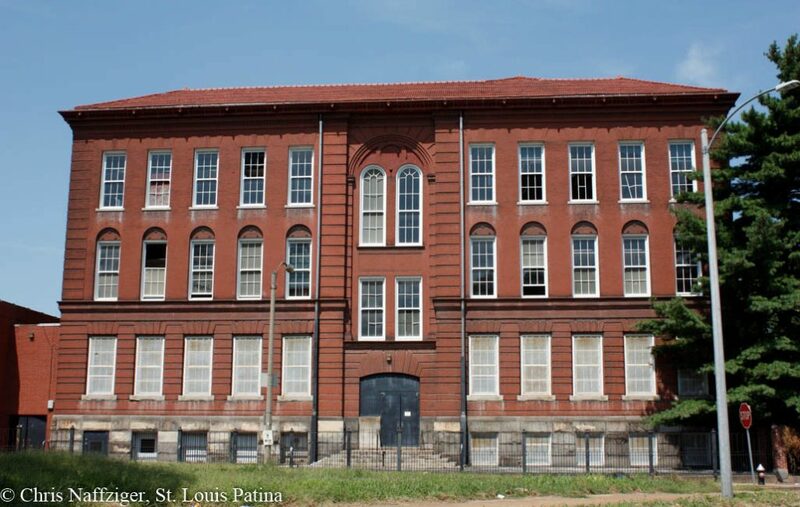 Im saddened when i visit St. Louis and see so many of these beautiful school structures vacant due to the demise St. Louis City allowed and planned to deprive these area’s of education. Hello Faith, good to hear from you! I didn’t realize you went to school in Hyde Park.